A man, here called man 1, and a woman, are engaged in conversation. Man 1: I’m your second choice. You are my second choice. Our relationship is doomed. Woman: Au contraire! Consider that our respective first choices are happily married. To each other. In panel 2, only the woman is seen. She stands and uses a pointer to point to writing on a writing board. Woman: . . .So in conclusion, our relationship maximizes our happiness. And it’s stable. Do the math. The writing on the board is divided into two columns. The LHS column bears the title: Men's List. Under this there are four rows of text. The RHS column bears the title: Women's List. Under this, too, there are four rows of text, aligned with the rows of the text in the left-hand-side column. The first row in the LHS column reads: A: a,b,c,d. The corresponding row in the RHS column reads: a: A,B,C,D. The second row in the LHS column reads: B: a,d,c,b. The corresponding row in the RHS column reads: b: B,A,C,D. The third row in the LHS column reads: C: a,d,b,c. The corresponding row in the RHS column reads: c: A,D,B,C. The fourth row in the LHS column reads: D: d,c,b,a. The corresponding row in the RHS column reads: d: D,B,E,C. A line connects the first row of each column. Another line connects the second row of the LHS column with the fourth row of thw RHS column. Another line connects the third row of the LHS column with the second row of thw RHS column. Another line connects the fourth row of the LHS column with the third row of thw RHS column. At the bottom of the writing board is one final line of text, approximately centered on the panel. This reads: Gale-Shapley algorithm. In panel 3, man 2 is talking to man 1. Man 2: So how are things between you and your new girlfriend? Man 1: Not bad. 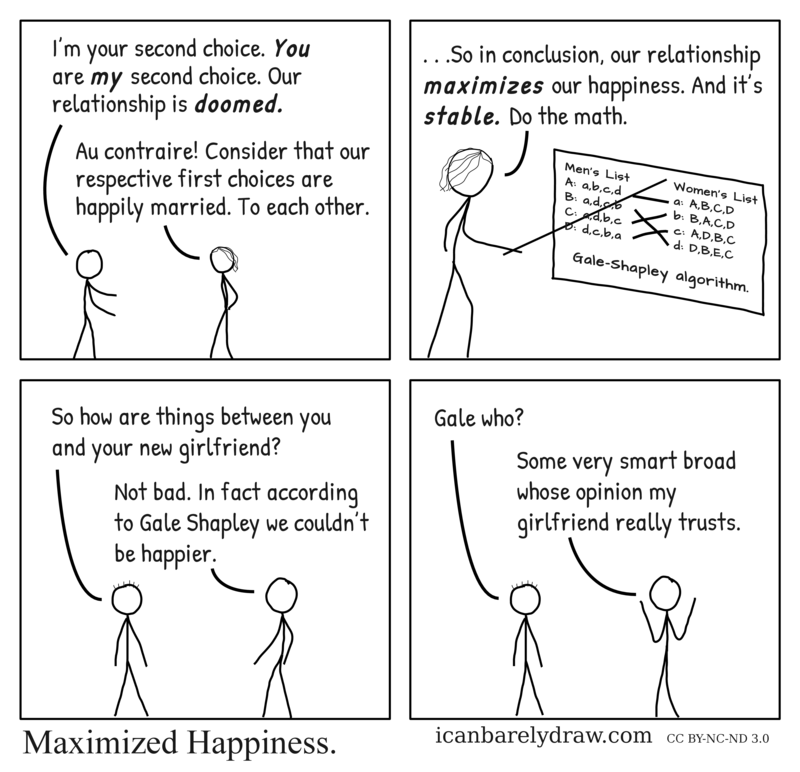 In fact according to Gale Shapley we couldn’t be happier. The conversation continues in the final panel 4. Man 1 holds each arm in a V shape, with hands level with ears and elbows pointing down. Man 1: Some very smart broad whose opinion my girlfriend really trusts.